"It is two acres of 28-feet-high solar arrays that provide shade for 30 recreational vehicles. The solar array design comes from a Chandler, AZ, company. It is considered a plus for KOA because it saves energy and power costs." ""Elements of the design that allow dappled light - we call dappled light - filtered light to come through, create patterns of light to come through, allowing you to grow trees, plants, flowers. 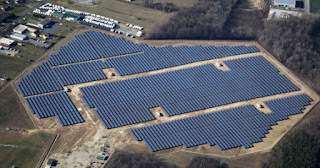 The elevated structure doesn't block the view of the horizon," said Bob Boscamp, president of Strategic Solar Energy." On Friday, December 4th, Here Comes Solar in New York City hosted a webinar on shared solar inclusion for low to moderate income communities. The topics discussed here are applicable nationwide. Debbie Dooley is a firebrand Republican and an outspoken founding member of the Tea Party. But in a fast-intensifying battle over the future of solar power in Florida, she isnot on the side you might expect. Along with a diverse grassroots citizens' coalition including environmentalists and other left-leaning activists, Dooley is taking on Big Energy and its big-spending conservative backers in an intriguing fight that puts her toe-to-toe with her onetime political allies. Connecting new housing estates to their own private electricity grids fuelled by renewable energy is the cornerstone of ZEN Energy’s plan to put power back in the hands of consumers. The company has launched ZEN Communities – an “end to end” service from power generation through to networks and retailing to deliver low cost renewable energy direct to entire communities. Turner said ZEN had teamed up with Greensmith Energy Management systems, which last year delivered a third of the energy storage market in the U.S., including the largest system in the world – big enough to power a regional township. “Suddenly we’ve got relatively new technology that has come down dramatically in cost to the point where we can build a renewable power station at a township level which takes the form of shipping container sized batteries – you might have five or six or 10 of these in a row,” Turner said. “It’s almost going back to the future – back 100 years to the old township-based power supply." South Australia is cementing itself as a world leader in green energy as companies begin cracking the code to make renewables commercially viable. Nearly a quarter of houses in South Australia have installed rooftop solar panels, making it one of the highest penetration rates in the world. It is also the largest producer of wind energy in Australia – the state’s 1.5 GW ofwind energy represents almost half of the country’s capability. South Australia made headlines around the world when it was announced that the state – 'a place with the population of West Virginia' – had been powered by 100 percent renewable energy for an entire working day. Turner said ZEN’s community projects could range in size from single homes to townships up to 20,000 properties. He said solar, wind, biomass, biowaste or hydro power could be generated within the community and moved around the mini-grid to where it was needed or stored for later use. “It’s all about optomizing the best natural mix of resources in an area that we can harness to produce the lowest cost power, then we balance that off with energy storage,” he said. ZEN’s first pilot project will begin next year at a housing development in Melbourne. Turner said the communities would be much easier to set up in green field sites where there were no connections to existing power networks. ZEN appointed high-profile Australian economist and national climate change review author Ross Garnaut as its chairman last month. “He quite clearly understands where energy markets are heading and as a result of that he’s become the chairman of ZEN,” Turner said of Garnaut. “We’ve got a very heavy hitting board and we’ve brought these people in to give us the leverage and the ability to work with the utilities and develop this new energy sector. To make this a reality you’ve got to bring the right people in." Turner said South Australia was perfectly placed to be at the forefront of renewable energy advancements. This article was published under a Creative Commons agreement by The Lead South Australia. Xcel Energy filed its monthly report for the Community Solar Garden program with the Public Utilities Commission last week, revealing that 24 projects are moving to the beginning stages of construction. Xcel also reports that, "after receiving over 600 applications in the surge to submit co-located projects, the pace has slowed considerably." There are currently 615 applications in the interconnection queue and 925 applications being reviewed for completeness, but the utility believes that "many of these projects in the application stage are 'placeholders' that may not be actively pursued by developers." Xcel adds that "63% of pending applications are in the application stage, 35% are either being studied or waiting for payment, and 2% have moved into construction." This project is very interesting as it takes advantage of recent IRS policy allowing each customer to claim a 30% federal tax credit. This eliminates the transaction costs associated with tax equity financing. Unfortunately, this model will only be available until the end of 2016. The project is also unusual in that it uses meter aggregation rather than virtual net metering. Each customer has a separately metered physical array on site. Part of the NY-Sun initiative, Affordable Solar is authorized to spend $13 million to achieve greater participation by low- to moderate-income customers in solar electric programs. The double incentives for low- to moderate-income homeowners will use approximately half of that funding. The other half will be used in the future to support shared solar projects for renters and others who do not have rooftops or who have rooftops that are unsuitable for solar. The Solar Utility Network Deployment Acceleration project, or SUNDA, is developing a standardized "Photovoltaic system package" consisting of engineering designs, business models, financing and insurance options, and optimized procurement that can reduce the cost of utility-scale solar projects. NRECA estimates these packages can reduce engineering design costs by 25 percent, procurement costs by ten percent and insurance costs by 25 percent. The SUNDA project aims to bring the cost of installed solar down to $1.60/Wp. Imagine a world where everyone owns their own solar panels. Whether from rooftop panels or a nearby solar garden shared with neighbors, each person will have clean, locally produced electricity as a birthright. With each solar garden the centerpiece of a community microgrid, power supply can be resilient to extreme weather, becoming an “island” of power when needed. Money for electricity stays local, building vibrant community wealth. The electric grid and utilities are re-engineered, managing a bidirectional flow of power from where the sun shines and wind blows to wherever it is needed most, dynamically changing with conditions. Batteries, both stationary and in smart-charging vehicles, provide support at night and when the sun goes behind a cloud. This is the distributed energy vision, which addresses both the problems of climate change and economic inequality. Solargardens.org has supported the distributed energy vision since early 2010, a time when the centralized energy paradigm was dominant. The plan on the table was for huge solar and wind power plants to be built in remote areas, with a web of new transmission lines bringing renewable power to the cities. While “big solar” remains a big part of the picture, distributed energy has gained traction in recent years in particular because of the rapid reduction in solar PV prices. Community and shared solar systems have expanded rapidly in the United States and several other countries. The openings of solar gardens programs in Colorado and Minnesota have lead to mini “gold rushes” as companies compete for opportunities, sometimes even bidding the price for renewable energy credits down to negative levels. New programs are getting started in California and New York, while Maryland and Hawaii join a dozen or so states with legislation supporting shared solar. More utilities including municipal, cooperative, and investor-owned have stepped up to the plate with voluntary programs. Because solar gardens have something to offer customers, developers, and utilities alike, the community solar sector has become the fastest growing of the U.S. solar industry, expected to grow to 5000 megawatts or more by 2020. In a recent paper, the Department of Energy estimates that shared solar could make up 32% to 49% of the distributed PV market in 2020. Given the increasing share of solar in the renewables market, shared solar will become an important part of a climate solution. The federal government has been active as well in promoting shared solar. The Department of Energy’s SunShot initiative issued $15 million in grants to encourage development in the sector. The White House announced the National Community Solar Partnership, bringing together government, developers, nonprofits, and industry groups while establishing funding for projects supplying affordable housing. The National Renewable Energy Laboratory has continued to support the industry with research and how-to guides. The potential for the 30% Investment Tax Credit (ITC) to expire at the end of 2016 is roiling the U.S. solar industry. While the credit was an engine that drove the solar industry’s growth, substantial transaction costs associated with tax equity make it an inefficient way to fund projects, particularly the modest-sized arrays typical of community solar. The silver lining of an ITC expiration would be the simplification of the business structures needed to operate a community solar garden. Nonprofits and cooperatives could manage shared solar systems and take advantage of state and federal securities law exemptions. In the meantime, recent IRS rulings will allow community solar subscribers to claim the tax credits for their ownership stake. Business models and software can be made available to community groups as “open source”. In the international realm, cooperatively owned solar power is commonplace in countries such as Great Britain and Australia, while unheard of in other countries, including China. With increased cooperation between China and the United States in the prelude to the Paris climate talks, Asia’s dense cities represent a huge potential market for offsite solar PV. In the developing world, community microgrids for rural electrification are offering opportunities to thousands. Community ownership models can be applied to assets other than solar panels, such as wind or other renewables, energy storage, or microgrids. Battery storage news has been dominated in recent months by Tesla’s PowerWall, using lithium-ion technology similar to electric car batteries. This has not, however, stopped the continuing drumbeat of innovation in this field, including metal air, flow, and organic batteries. The jury is still out on what will be the dominant chemistry long-term, but with so many technological avenues to explore a cost-effective leader should emerge. Ways for owners to monetize the benefits of batteries to the grid at large must be found. Microgrids promise local, renewable energy that can be reliably produced even if the larger grid goes down. By being able to operate independently, a microgrid can operate as both a load center and a virtual power plant dependent on supply and demand conditions. It can deploy generation, storage, and demand management to make its supply or demand predictable an hour or more into the future, a boon for utilities that must schedule power purchases. The microgrid business has been rapidly growing, with particular interest from areas that have recently experienced extreme weather events. It’s important to select good host sites that support the grid, are built environmentally responsibly, and are ready for potential developments such as microgrids including vehicle charging and stationary storage. Utilities can direct solar development to areas where it will minimize grid congestion and infrastructure costs. Because solar energy production takes up a lot of space, it’s important to focus on sites with multiple uses, such as crops or grazing (“agrivoltaics”), parking lots, or rooftops. Solar arrays may also be located in sites where land use requires a buffer, such as airports, water treatment plants, or roadsides. It would be useful to include a solar garden on each feeder, with participants on the same line, to reduce transmission losses and potentially support conversion to a microgrid. Having a solar garden in the same community as participants fosters a sense of local ownership and keeps money local - that’s why we call it community solar. Excitement around community solar is growing, and solar gardens are sprouting up everywhere! Each project has a passionate champion, a “solar gardener” who is part project manager, part community organizer. Solar gardeners are building a grassroots movement to keep energy and money local while protecting the climate, air, and water. Maybe that’s you, or maybe you’d like to get started… Let’s do it! Recently, I took some time to travel to China and learn about the potential for the international market. 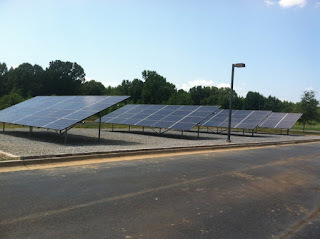 Given the exciting community solar environment today, I am restarting the Solar Gardens blog. The format will be a bit different, including a weekly post on an interesting topic in community solar, and a weekly news round-up. I hope to improve solargardens.org, finding new ways to provide value and new partners to work with to better serve the community solar community. Let’s work together to make this grand vision possible. "The first community solar garden has sprouted in Xcel Energy's Minnesota service area — on a farm." "Utility officials, the project developer and its customers held an open house Friday at Vetter Farms near Kasota, Minn., where 96 ground-mounted solar panels now offset electricity used on the farm and by nearby homes." The recent NREL paper "Shared Solar: Current Landscape, Market Potential, and the Impact of Federal Securities Regulation" gives a good glimpse at the potential of community solar in the United States. The market potential is clearly enormous in the near future. The authors assert that shared solar will account for just about all the growth in the U.S. solar market after the Investment Tax Credit expires at the end of 2016. "Combining the potential market penetration of the shared solar business model in the residential and non-residential sectors [...] we estimate that shared solar could represent 32%–49% of the distributed PV market in 2020, growing cumulative PV deployment by 5.5– 11.0 GW and representing $8.2–$16.3 billion of cumulative investment." That's a lot of solar gardens! The paper recounts research using LIDAR models suggesting that about 50% of U.S. households cannot host a PV array of 1.5kW or greater. This is significantly less than the 75% number typically used in the community solar industry, and should be considered a lower bound, as it does not allow for poor quality roofs, historic districts, and the like. New IRS rulings make the tax picture look more hopeful for subscribers to be able to claim their own tax credits, although this will only matter until the likely ITC expiration. "While it’s true that solar is more competitive than ever, it is still not an equal-access commodity; and competitive pricing may not help much if you don’t own property or enjoy a good credit rating. For this reason a number of CESA member states have expressed interest in programs, such as community solar, that could help make the technology accessible to those who have not heretofore been able to access it." "Now Vermont has taken the concept a step farther, with a financing program for community solar projects that will buy down interest rates for residents who need to borrow in order to participate. The Vermont Community Solar Loan Program, administered by the Vermont Public Service Department’s Clean Energy Development Fund, will provide affordable financing to help low-income Vermonters buy an ownership interest in community solar projects with up to 500 kW capacity. The interest rate buy-down will be funded through support from the SunShot Initiative Rooftop Solar Challenge II, and the loans will be administered through the Vermont State Employees Credit Union. The program will offer unsecured or secured loans up to $40,000, with terms up to 15 years." "New York officials are encouraging cities and towns that are planning community microgrids to couple them with community solar or ‘shared renewables.’"
"Community microgrids and community solar are viewed as natural brethren, given that both are local energy alternatives with communal benefits. Some companies are forming a new business model around the idea of bringing community solar to microgrids." "Central Electric Cooperative will ceremonially launch Oregon's first 'community solar' project with a 'panel-hanging' next week near its service center in southeast Bend." "The community solar project lets CEC members voluntarily share in the costs and benefits of the 200,000-watt installation on approximately 1.7 acres of land adjacent to the co-op’s Bend Service Center"
It's all through our Founding Principles - Tree Preservation, Share the Land, Shade Over Pavement, Be a Good Neighbor... What it comes down to is multiple uses for the space taken up by solar panels. "Agrivoltaics" is a term for raising plants or animals on land occupied by solar farms. It's great to see this happening more and more! "The Community Solar installation at Lopez School is complete and the new solar panels will be supplying 9.9 kilowatts of electricity to the school ongoing." "More than 70 contributors invested or donated a total of $35,000 to purchase and install the panels. Those investing will receive approximately a 10 percent payback per year and the school will receive the electricity generated for free. After ten years investor principal will have been returned and the school will own the panels outright." "Community solar in the U.S. is flourishing as never before. An important new ruling by the IRS may serve to accelerate this growth. Homeowners are eligible for a 30% federal investment tax credit (ITC) for solar installed on their roofs, under IRS Section 25D. This credit was understood to only be available for rooftop solar owners. But, a recent IRS ruling found that the owner of an offsite solar array could also be eligible for this credit. The IRS ruled that Roland Marx, a co-founder and member of Vermont’s Boardman Hill Solar Farm, is eligible for the ITC. This is despite the fact that the energy his system generates comes from a remote solar array and not from his roof. 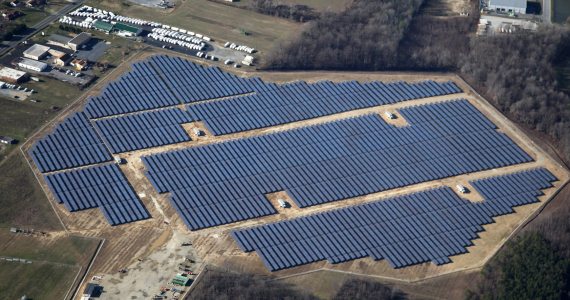 This ruling could have a serious impact on the speed at which projects like the Boardman Hill Solar Farm develop. To understand why, it is necessary to understand how Mr. Marx’s solar ownership works." "Solar and low-income energy assistance programs have long been seen as incompatible. With the recent boom in the solar energy market, however, these programs have begun to converge. Increased attention to the socio-economic benefits of solar energy has driven the desire to address participatory barriers within the market. Improving the accessibility of solar energy to low-income populations has become a possibility with the onset of the community solar movement. Once a hope, it is now a tangible reality that clean energy will cease to be a luxury in the United States." Big energy development is often imposed on local communities, who find they have little say in the matter. Fracking, nuclear, big transmission lines - or even oversize, poorly sited solar or wind development - can lead people to fight back. The folks in Balcombe set up a blockade to keep the frackers out - but they also took power into their own hands and created a locally owned solution. So the Chiddingly Farm solar power station was born. (March 23) – The House gave voice-vote approval this morning to a bill by Rep. Faith Winter, D-Westminster, to expand siting options for community solar gardens. Demand for solar gardens is high and growing, but is being constrained by rising land values and construction costs. HB15-1284, sponsored by Reps. Winter and Kit Roupe, R-Colorado Springs, would allow community solar gardens to cross county lines, with customers in one county able to plant solar gardens in a contiguous county.